In the category of "What Took Them So Long? ", we have news this evening that Piers Morgan is being sundered from the CNN line-up no later than the end of his contract next September. 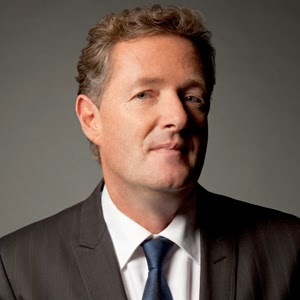 Morgan is the insufferably condescending British snob who has hosted Piers Morgan Live after Jonathan Klein, then head of CNN, inexplicably hired him in 2011 to take over from the long-running Larry King upon retirement. King's numbers had been slumping, and Morgan continued the decline. The inexplicability of Klein's choice went beyond the weird notion that the iconic show dedicated to interviews that focused on American political and pop culture was to be handled by a Brit. Nothing wrong with the British, mind you – I'm somewhat of an Anglophile myself, and his countrymen such as David Frost and Alistair Cooke did quite well here, even if limited in their presentation. No, Morgan was already known for his pompous airs, even by the British, and his recent fame then was the fact that he had been fired as editor of the Daily Mirror in 2004 when it was learned that he was responsible for the publication of doctored photos that purported to show British soldiers in Iraq torturing Iraqi prisoners. The photos caused an enormous stir, "putting the lives of British soldiers at risk" according to Members of Parliament on both benches as well as British military officers. Once the hoax was revealed, he declared that he would not resign and declared, "All I want to say is that we published the truth." (A British version of Dan Rather, as it were.) The publishers learned of his outrageous statement and about the same time they learned that he was "laughing and joking" with colleagues on the matter. He was summoned to the office of the chief executive for a short meeting, whereupon he was directly escorted from the building by security, leaving his belongings and his jacket folded neatly over the chair in what was then his former office. Within moments, after conceding that "the Daily Mirror has been the subject of a calculated and malicious hoax", the publishers announced "The board of Trinity Mirror has decided that it would be inappropriate for Piers Morgan to continue in his role as editor of the Daily Mirror and he will therefore be stepping down with immediate effect." Yet Klein hired him nonetheless. Morgan's three-year posting was marked by his aggressive style and disdain for the Constitution and its Second Amendment in particular, and his attitude continued with his frequent and strange (considering his surroundings) tweets about "real football" (soccer) and cricket. He approached his interviews as if he were channeling George III, patronizingly lecturing Americans on how to get it right. A telling episode about his popularity (or lack thereof) among the public as opposed to the 'experts' was during a run of online petition requests to the White House (with the administration becoming increasingly weary of them, steadily increasing the ante of the threshold of minimum numbers of signatories), in which one of the more popular was a petition to expel Morgan and return him to the UK. In response, a similar petition was initiated in the UK declaring that the British didn't want him back. Yet another irony in this hosanna is that Morgan can take solace from his brief experience between jobs which can provide some perspective, that of hosting a show on the BBC called You Can't Fire Me…I'm Famous. And both of his viewers have registered their protests. I daresay (there's a bit of Brit for you) you have many more readers than Piers---what a plumy name. Very appropriate for a nitwit. Agreed. I appreciated the line from Spinal Tap, that "our fan base is becoming increasingly selective." As for my readers, dear as they are, I would like to believe that they are selective to begin with, their numbers limited by their fine taste. It's interesting that so many producers will throw good money after bad with Left-leaning shows (Left-wing talk radio, for example) in a prolonged effort to believe that the American public simply has to realise at some point that they have been wrong and come round to the proper perspective. They just keep pounding that minor key until we all sing along.